Willow Springs … a Family Farm » Blog Archive » Atlanta! It’s almost time for AmericasMart Atlanta, and I can’t wait!! So many treasures are waiting to be discovered, what will I come home with? 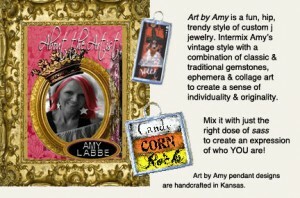 I am anxiously awaiting to see Art by Amy and John Wind, my two f avorite jewelers….. just hope my wallet survives! 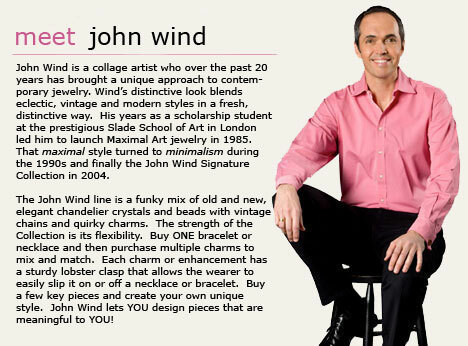 I have been drooling over the new John Wind Catalog and know that everything will look even prettier in person. While I like their gold jewelry, I’ve always been more of a “silver” person, they have FABULOUS silver items now!!! How will I choose? 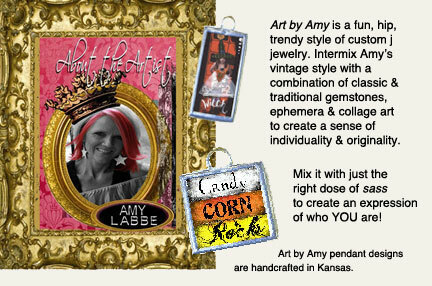 Amy’s booth is always crowded with people discovering unique “design your own” items. There are baskets and trunks of bobbles and framed art, along with a variety of necklaces and bracelets for them to be attached too. The fun in when you bring all of these pieces to the counter and watch them transform in front of your eyes as Amy, or one of the other designers, assemble them for you! I am always amazed at how they turn out. If you have seen something online that you like, or have an idea of something, email me and I will be happy to get something made for you. 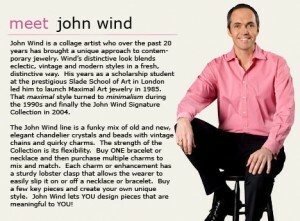 I would also like to know if there is a particular piece from the John Win d line that you would like me to order. I’m pretty sure that I will be spending a lot of time in these two booths, but will have to pull myself away to check out some of the other vendors. What about ornament?! Who will have that ornament that I will just HAVE to have? Christina’s World, JingleNog, Radko, Joy to the World, Thomas Glenn or one of the other great lines? Who is YOUR favorite designer? While I do not carry all of these lines, I love “helping” my sister, Connie Porcher, of Celebrate 365 select her ornaments! I know I had fun last year. If there is anything, or anyone, that you think I should do or see there, drop me a line. If you will be there, stop by the Snow Children booth as Elaine Roesel lets us use that as our “home base”.